Do Amendments IX and X of the Constitution of the United States imply a certain reservoir of unspecified rights and powers of the people? In a grave matter without precedent and of imperative public importance, where strong and universal delusion results from fraud, does this reservoir of rights and powers of the people provide a way to meet these exceptional circumstances, particularly when the aforementioned fraud emanates from within the government itself, from the very agency that is charged with enforcing the laws of the land? Does this reservoir of rights and powers of the people confer on a citizen, who confronts his government with irrefutable evidence of its very serious wrongdoing, proper standing to pursue justice for all? 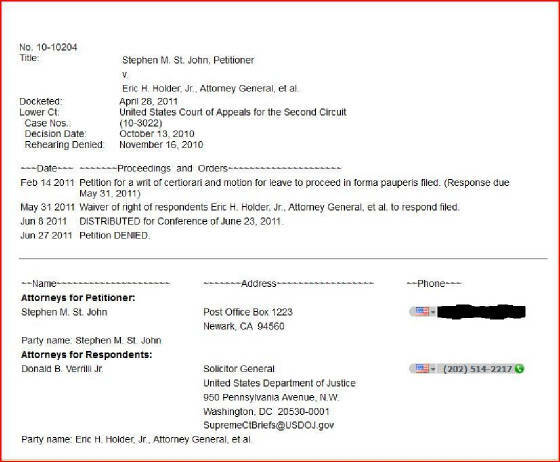 Is the Petitioner’s discovery of a bogus 9/11 “Dulles Airport” surveillance video that was used by the US Department of Justice to fool the public and a jury and to frame Arabs for the heinous crime of the century tantamount to an exceptional circumstance conferring on a citizen the right to sue in pursuit of justice for all regardless of any provision that normally requires his demonstration of actual damage? All parties appear in the caption of the case on the cover page. 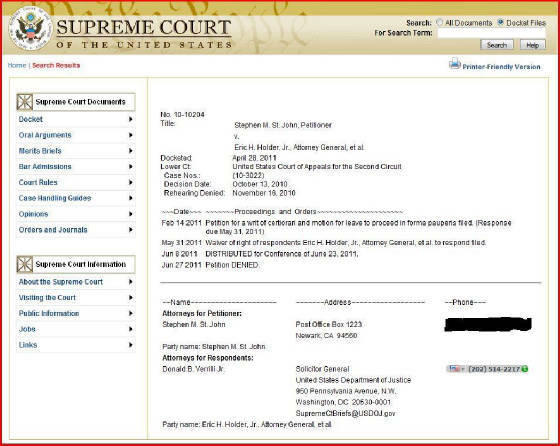 On 13 October 2010 Judges Sack, Parker and Raggi of the United States Court of Appeals for the 2nd Circuit denied a motion for leave to proceed in forma pauperis and dismissed the appeal. On 16 November 2010 they denied “a motion for reconsideration.” On 22 February 2011 the Clerk of this Court advised the Petitioner to resubmit a corrected petition. Petitioner believes Amendments IX and X of the Constitution of the United States confer on this Court jurisdiction to review on a writ of certiorari the judgments and orders in question. The Petitioner seeks review of a judgment by a United States court of appeals, and hereby states the basis for federal jurisdiction in the court of first instance. The subject matter jurisdiction of the United States District Court for the Southern District of New York was properly based on consideration of both federal questions (28 USC § 1331) and diversity of citizenship (28 USC § 1332). Allegations were made of fraud (18 USC § 35); conspiracy to commit fraud (18 USC § 371); obstruction of justice (18 USC § 1512(c)); treason (Constitution of the United States, Article III, Section 3; 18 USC §§ 2381, 2382, 2384); and initiating aggressive war (Nuremberg Principles, VI(a); Charter of the United Nations, Article 2.4; Constitution of the United States, Article VI, Supremacy Clause) by employees of the United States Department of Justice and others as yet unidentified, including foreign nationals and United States nationals with dual citizenship. These crimes were carried out in Herndon, Virginia; Alexandria, Virginia; Washington, District of Columbia; New York, New York; and other parts as yet unknown. 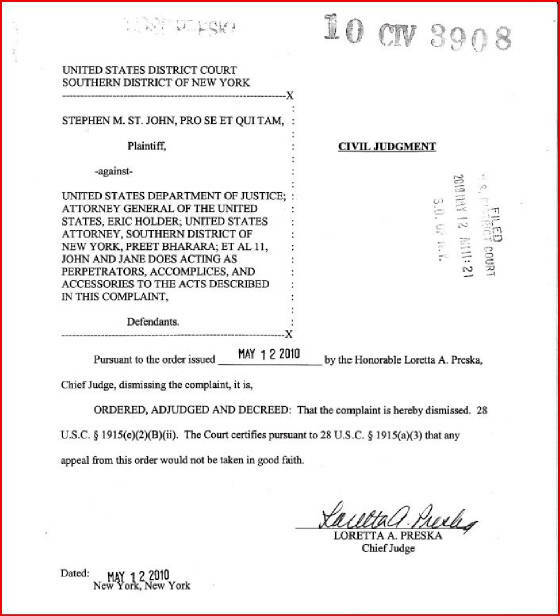 The appeal was from Chief Judge Loretta A. Preska’s sua sponte Civil Judgment and Order of Dismissal of 12 May 2010, for which she later issued a Certificate of Appealability on 27 July 2010. The Petitioner’s actions at both the district and appellate court levels yielded only sua sponte judgments and orders of dismissal; hence these actions were in effect entirely ex parte with no known involvement of the respondents. Notwithstanding Chief Judge Preska’s judicial erudition and focus, the Petitioner believes that a just remedy emanates from Amendments IX and X of the Constitution of the United States in a case of most unusual and compelling circumstances and of utmost importance where tried and true methods have not worked and still do not work. The Petitioner caught the US Department of Justice in a false and misleading presentation of evidence about 9/11 to the public and to a jury; namely, a demonstrably bogus 9/11 “Dulles Airport” surveillance video. In a case of such exceptional and compelling circumstances, he believes he has proper standing to sue as a natural right springing from the reservoir of unspecified rights and powers implied by Amendments IX and X of our Constitution. Otherwise, the limitations imposed by an overly narrow definition of standing only serve to cover up and perpetuate a major fraud that, as one component of a coldly calculated ruse to create a pretext for war, led to unjustified invasions and occupations of Afghanistan and Iraq. The courts must join with a citizen in preventing or otherwise exposing fraud and force, and not set barriers. 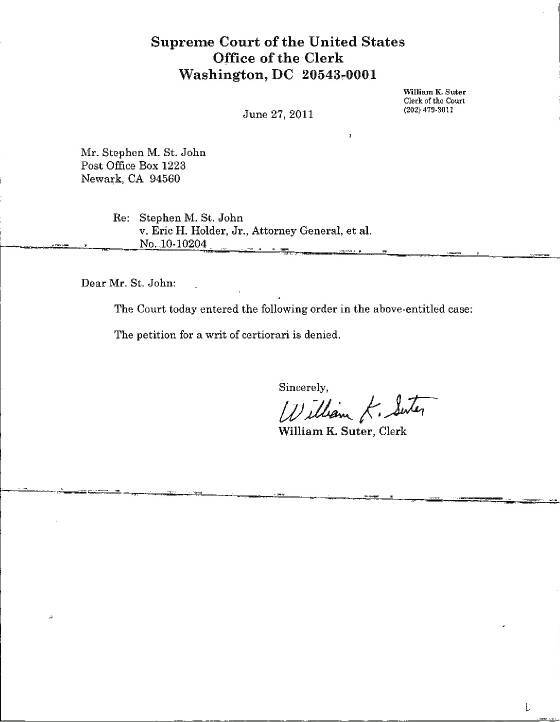 This Court now has a unique opportunity to prosper the Petitioner’s quest for governmental accountability about 9/11 and satisfy a worldwide yearning for truth and justice on this very grave matter which has adversely affected millions upon millions of people. For whatever reason, the appellate judges did not detect from the Petitioner’s intuitive reasoning the grounds on which he bases his claim of most exceptional circumstance that overrides the actual damage test for proper standing. The matter was ignored altogether, and remains an important question of federal law that has not been, but should be, settled by this Court. Amendments IX and X of the Constitution provide a source of resilience and innovation for matters that are unprecedented and unforeseen. 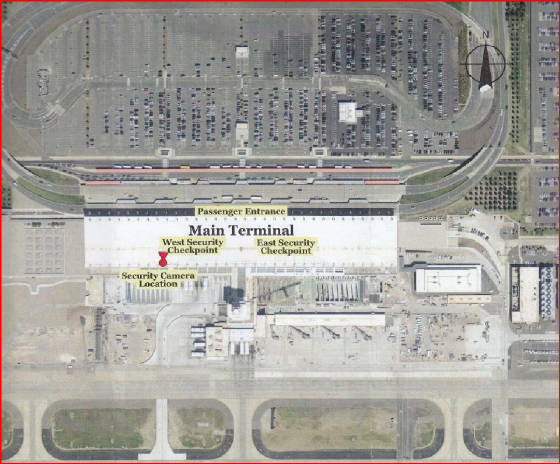 The Metropolitan Washington Airports Authority recently confirmed the Petitioner’s correctly deduced location and view of the video surveillance camera at “West Security Checkpoint #1” at Washington Dulles International Airport on 11 September 2001. 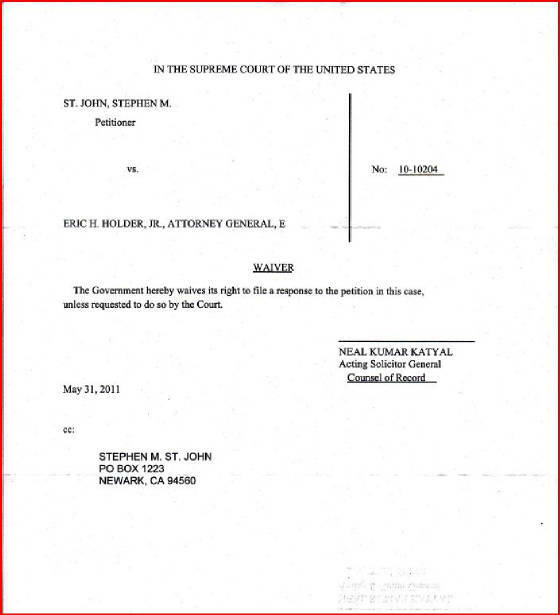 (Per Rule 14(1)(i)(vi) please see Appendix D.) This new information reinforces the Petitioner’s original challenge in the lower courts to the authenticity of the video which had been used by the Associated Press to promote the publisher’s release of the 9/11 Commission Report on 21 July 2004 and by the US Department of Justice to convict Zacharias Moussaoui in 2006. This surveillance video allegedly shows five Arab hijackers passing through the security checkpoint at Dulles Airport on their way to boarding American Airlines Flight 77 on the morning of 9/11. Now that the Metropolitan Washington Airports Authority has established beyond any and all doubt that the surveillance camera pointed north and passengers walked south through the checkpoint, a reliable framework from Dulles Airport authorities permits final analysis of the sun’s shadows cast by passersby seen outside the terminal entrance in the far background of the video. (Per Rule 14(1)(i)(vi) see appendices D and E.) These shadows are pointed south at a heading of approximately 180°, which means the sun had to have been rising at the north cardinal point of the compass on the morning of 11 September 2001 in Herndon, Virginia. This of course is impossible and the only conclusion to be made is that the video is a total fraud. The video could not possibly have been made at Dulles Airport, but was made elsewhere, at a place and time as yet unknown, and then falsely presented first to the public and then to a jury as having been filmed at Dulles. The lower court judges somehow failed to appreciate these circumstances as exceptional and compelling, but instead insinuated that the Petitioner’s just cause in the public interest is either frivolous or malicious. The Petitioner avers that whatever the true provenance of this purported “Dulles Airport” video, it staggers the mind to imagine a scenario not indicative of foreknowledge and preparation for the framing of Arabs in a classic “false flag” military intelligence black operation. Again, the lower court judges did not see that the solitary effort of one citizen, the Petitioner, to expose the fraud is tantamount to a compelling and exceptional circumstance very much in the public interest. Furthermore, the Petitioner avers that such a ruse to commence unjustified and immoral invasions and occupations of Afghanistan and Iraq with a fake video is an act of treason at home and the supreme war crime abroad according to international law, particularly the 1950 Nuremberg Principles. Shouldn’t the lower court judges have moved heaven and earth to allow the Petitioner wide latitude in exposing fraud and force? The Petitioner points out that the invasions of Afghanistan and Iraq began in a very real sense at three airport gates on the morning of 11 September 2001. Yet we have NEVER seen ANY credible video surveillance evidence of ANY of the passengers or hijackers at ANY of the three airports from which the flights of 9/11 are said to have departed. Billions of people around the world were mesmerized by heavily repeated broadcast images of two alleged hijackers passing through a security checkpoint, but few know the video actually came from Portland Maine International Airport. This Portland tape and the bogus “Dulles Airport” tape are all we have in the category of routine video surveillance evidence for 9/11. How could the appellate judges not see in these circumstances compelling reason to override the actual damage test for a unique and original action to expose serious wrongdoing and find out what really happened? These grave issues go to the heart of good governance and integrity in government. Now we know why our government could not respond in a forthright way to the Taliban’s good faith offer to hand over Osama Bin Laden upon presentation of evidence of his involvement in the crime of the century. Our government lacks evidence. It also lacks integrity. It did then, and it does now. The current administration countenances the manifest criminality of the previous one, and sixteen months after having been apprised of the bogus 9/11 “Dulles Airport” video by the Petitioner’s repeated faxes, emails, phone calls and personal visits, it is at the very least an accessory after the fact. The bogus “Dulles Airport” video is just the tip of the iceberg of accumulated evidence undermining the official findings of the 9/11 Commission Report. It is unique, however, in that the video presumably has a chain of custody of evidence which will lead to the Praxis of Evil in our midst which actually pulled off 9/11 and the cover-up. Why would the lower court judges baffle such a fortuitous discovery that explodes the myth of 9/11? The Co-Chairmen of the National Commission on Terrorist Attacks Upon the United States, Thomas H. Kean and Lee H. Hamilton, have already indicated in their book Without Precedent that they were “set up to fail” in their investigation of 9/11. What better argument can there be for the establishment of a new and a real investigation? Such a new and real investigation of 9/11 – one that will look into foreign infiltrations and espionage, as well as high tech piracy of telecommunications, computer, radar and flight control systems - is the main remedy sought by the Petitioner in the lower courts. The investigation will work in tandem with a federal grand jury in New York. Is this not a reasonable goal in the interests of truth and justice for all? The sun and its shadows are unimpeachable witnesses at Washington Dulles International Airport on the morning of 11 September 2001. Basic astronomy and geometry give the proof of our government’s fraud and force. A choice now presents itself to the esteemed members of our nation’s highest court. Do we follow the light in pursuit of 9/11 truth and justice? Or do we join or maintain the ignoble conspiracy of silence and of shunning surrounding this very grave matter? By directing the lower courts to regard Amendments IX and X of the Constitution not as dry artifacts in a legal desert, but as living sources of resilience and innovation for unprecedented and unforeseen circumstances, the prospect for truth to be told and justice done will come alive to the benefit of all mankind. The Petitioner’s discovery of treasonous, warmongering fraud on the people of the United States and indeed the people of the entire earth should be introduced in an adversarial process where the respondents will be confronted with the evidence and compelled to respond in a reasonable way according to the law and the grave responsibilities of their offices. In light of these very serious crimes, the Petitioner should not be impeded by a legal stricture with respect to standing, but should go forward in the best interests of justice and the good name and national security of the United States of America. In this unique and compelling circumstance, where the Petitioner is quite alone in making his discovery and accusation against the chief law enforcement agency of his nation and in the face of a conspiracy of silence and of shunning, shouldn’t the status of proper standing devolve upon him as one of the unspecified rights guaranteed by Amendments IX and X of the Constitution of the United States? Is this not a simple matter of a natural right to hold his government to account for serious wrongdoing when no one else can or will? The wise advice seen on New York City subway posters to heighten security awareness - “If you see something, say something” - goes to the heart of the matter. Herein is the essence of what promises to be a landmark case of a solitary citizen standing at the gates of justice and shaking the nations of the earth from very strong delusion about 9/11. But what kind of jurisprudence denies a watchman’s approach, let alone his warning? In a very real sense all citizens who see something and say something have standing and a corresponding natural right to a responsive government. Amendments IX and X of the Constitution of the United States guarantee that no law or statute or decision can deny the Petitioner’s right to a responsive government, let alone reasonable relief that leads in this case to exposure of treasonous, warmongering fraud and rewards his vigilance and perseverance against all odds and under circumstances never before encountered or even imagined. The Petitioner is not asking for the moon, but a chance to confront the Respondents with his evidence in a moment of truth. Furthermore, the remedies sought by the Petitioner are reasonable, forward looking, corrective, collaborative and in the best interests of justice, our national security and our nation’s good name and proper standing as a sovereign equal among sovereign equals. The Petitioner also reminds this Court that one purpose of the Judiciary is to check the excesses of the executive and legislative branches of government and if this is not done in this instance our nation will be exposed to adventitious outcomes. Appellate Court’s Order denying "Motion for Reconsideration"
The aerial photo above was kindly provided by the Metropolitan Washington Airports Authority and shows the Main Terminal at Washington Dulles International Airport and its orientation with the main parallel runways that go north/south at 10°/190° headings. The aerial photo above of the Main Terminal at Washington Dulles International Airport was provided by the Metropolitan Washington Airports Authority after it was edited to show the north cardinal compass point, the passenger entrance on the north side of the Main Terminal, the location of the surveillance video camera at “West Security Checkpoint” and its view northward. where one scrolls down to Exhibit NT00211 and clicks to download. The Petitioner’s analysis of this videotape reveals that it could not have been filmed at Washington Dulles International Airport as falsely stated and maintained by the US Department of Justice, the respondents in this case, but was filmed elsewhere at a time and place as yet unknown. 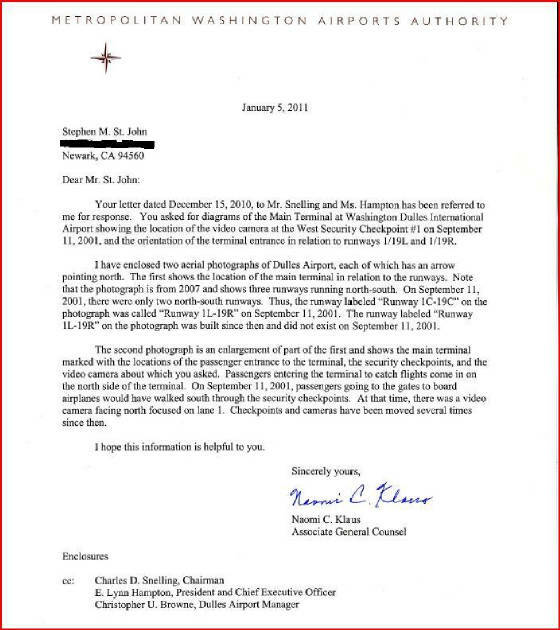 The Metropolitan Washington Airports Authority has confirmed beyond any and all doubt that on 11 September 2001 the camera faced north and passengers going to the gates to board airplanes entered the terminal on its north side and walked southward through the security checkpoint. Therefore, the shadow of the passerby seen just outside the terminal entrance in the far background of the video (outlined in a yellow oval) is pointing south at an approximately 180° heading. This of course means the sun had to have been rising very near the north cardinal point of the compass on the morning of 11 September 2001 in Herndon, Virginia. But this is impossible. One must conclude the video is bogus. chapter 97 or chapter 111 of this title shall be subject to a civil penalty of not more than $1,000 which shall be recoverable in a civil action brought in the name of the United States. (b) Whoever willfully and maliciously, or with reckless disregard for the safety of human life, imparts or conveys or causes to be imparted or conveyed false information, knowing the information to be false, concerning an attempt or alleged attempt being made or to be made, to do any act which would be a crime prohibited by this chapter or chapter 97 or chapter 111 of this title - shall be fined under this title, or imprisoned not more than five years, or both. (2) otherwise obstructs, influences, or impedes any official proceeding, or attempts to do so, shall be fined under this title or imprisoned not more than 20 years, or both. (a) Crimes against peace: (i) Planning, prepaaration, initiation or waging of a war of aggression or a war in violation of international treaties, agreements or assurances; (ii) Participation in a common plan or conspiracy for the accomplishment of any of the acts mentioned under (i). (c) Crimes against humanity: Murder, extermination, enslavement, deportation and other inhuman acts done against any civilian population, or persecutions on political, racial or religious grounds, when such acts are done or such persecutions are carried on in execution of or in connexion with any crime against peace or any war crime.